First stop in the Road-To-The-Sun Tour was a photo stop (and narrative) of Wild Goose Island (and beyond) in St. Mary Lake in Glacier National Park..
A long, long time ago, two native tribes resided on opposite sides of St. Mary’s. Even though they seldom fought, they had no interaction. One day, a strikingly handsome warrior from one tribe noticed a beautiful woman on the other swimming toward the island. He couldn’t resist her beauty immediately swam to meet her on the island. The two met, clicked instantly, spoke for hours, and became engaged. They promised to meet again tomorrow morning on the island and each swam home. Upon reaching their tribal shores, they realized they had created a massive problem. Each tribe’s elders demanded that the engagement be broken off. Well, the two lovers didn’t agree and met each other the next morning on the island. After a quick discussion, they decided to run away and find their own land to marry and live. 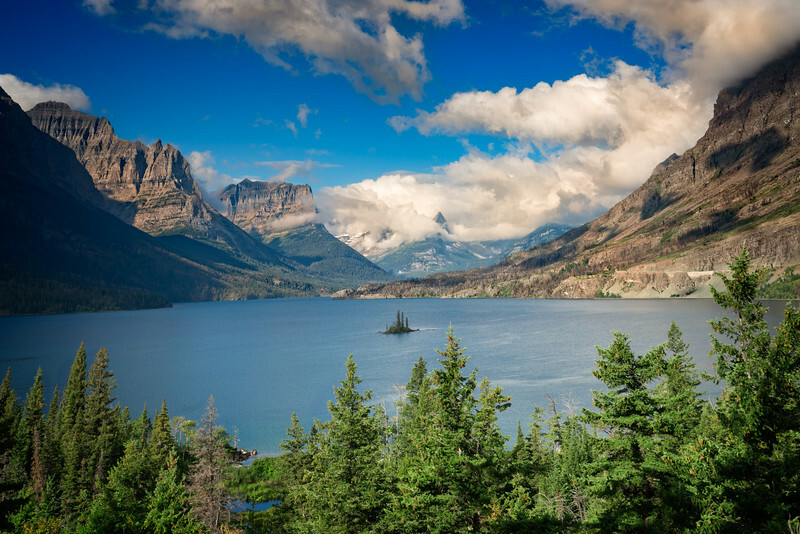 From then on, the small island in the center of St. Mary’s Lake in Glacier National Park was known as Wild Goose Island.